I immediately recognised this man’s face but couldn’t put my finger on where I knew him from. It was only after I saw his smile that I remembered who this man was. I’ll never forget that smile, such an enchanting smile. The same smile on the cover of his book. Before I could get a word in, the elevator door was opening and he says to me, “I hope you enjoy the rest of your stay here in Cape Town.” I must have mentioned my relocation to Cape Town. I was clearly in a trance the whole time. Still today I kick myself for not giving my condolences on his long time friend that he refers to in his book as his elder brother, the late President Nelson Mandela. I will forever hold this memory and tell my kids how I once bumped into a living angel. An angel who sacrificed a big part of his life for my freedom and for theirs, for the democracy of our country! The man was in prison for 26 years and 3 months, eighteen of which he spent at Robben Island along with the great giants, Walter Sisulu, Nelson Mandela, Goven Mbeki, Raymond Mhlaba to name a few. 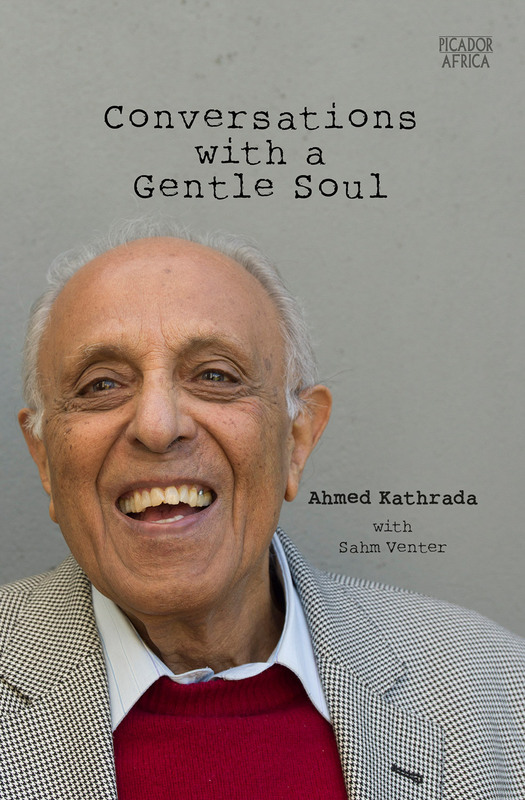 In spite of what he and other struggle icons went through for the country, Ahmed Kathrada still manages to smile, to joke about, to find and give love and more importantly to forgive. He is indeed a gentle soul, a humble man. He played an incredible role that we should never forget. There’s nothing special that I can say. Just that I had the privilege of working with comrades and leaders who inspired me all my life. I will remember that privilege ’till the end’. From the book, you get to know and appreciate this gentle soul. It is a great piece of literature and I hope that South Africans and Africans as a whole get to read and know this man whose acts of heroism helped shape our freedom and equality. An icon we must celebrate while he is still alive (even though according to the book, he is very shy!). You can order Conversations with a Gentle Soul here for your children too. This entry was posted in African Literature Update, South Africa Literature. Bookmark the permalink.